Courtney suggests, "Maybe in today's health conscious mindset the 'Donuts' are actually apple slices or oat bran." 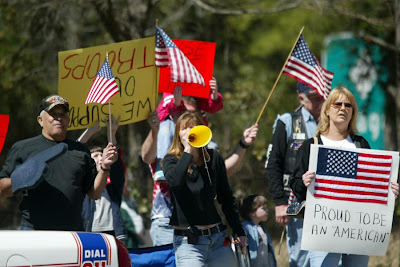 I guess people of ambiguous gender, children and gendered fetuses can do what they want. Thanks Mike! Chelsea spotted this at a pet store. 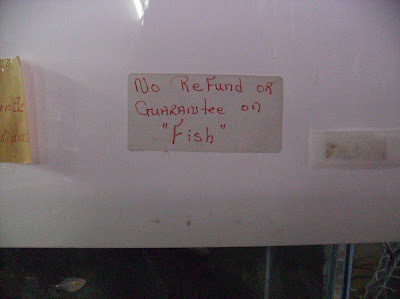 I definitely am not buying something if there's not even a guarantee that it is a fish. 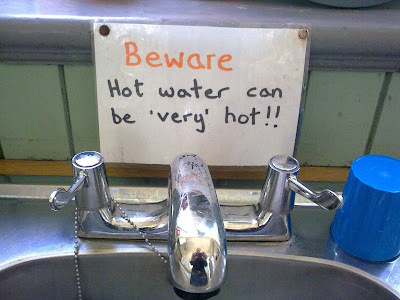 James writes, "Found this in a day-care centre for toddlers - I guess they are a bit more sensitive to heat than us toughened oldies." The management is around sometimes, but they like to train for a marathon during business hours, so good luck with finding them. Thanks, Brooks. I guess when you see that, you can be in awe, or just say "awe." Thanks, Sara! 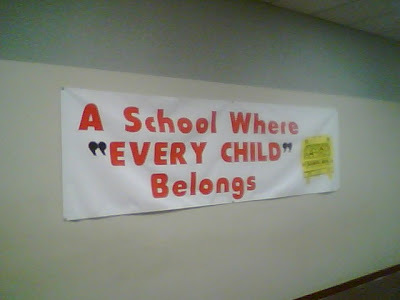 At this school, they do not in fact host all children in the entire world. It's just not that big, no offense chinese kids. Thanks, Rich. Thanks to Julia Lovett for this marker-board tribute to the late Michael "King of Pop" Jackson. 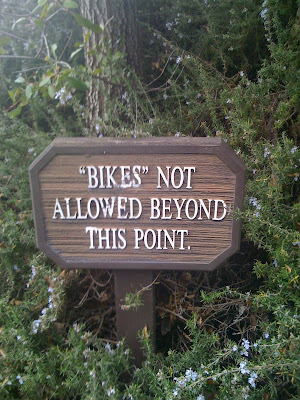 I don't know what it is that the kids are calling bikes these days, I assume motorcycles and bicycles are not allowed, but I would think bikes unpunctuated would capture that. Thanks, Addie. 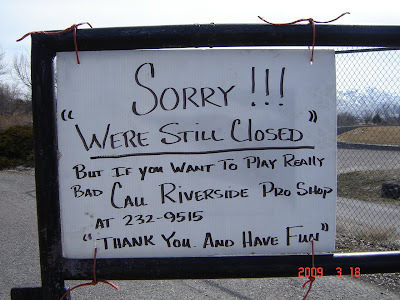 Actually, this sign makes it seem like this golfcourse really isn't closed, since you can call somebody and still play. Maybe it will cost you, hence the ominous "thank you and have fun". Maybe you'll play golf while being hunted like an animal for sport. Thanks, Heather. 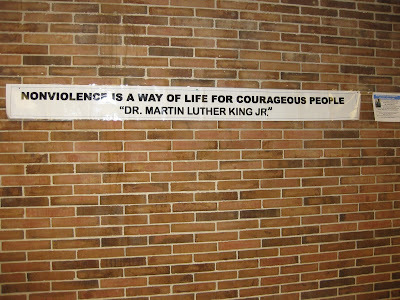 I think this one is just confused, you punctuate the quotation, not the speaker... thanks Jay. 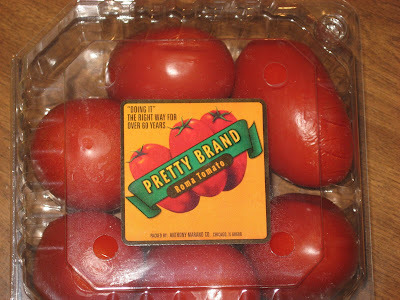 I didn't know tomatoes reproduced that way. Color me enlightened. Thanks, Bill. 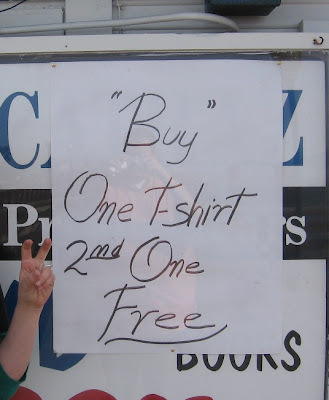 I think this sign is suggesting a double five-finger discount. Thanks, Jason. This is probably a live teller in a robot costume. At least, I hope so. Thanks, Evan. 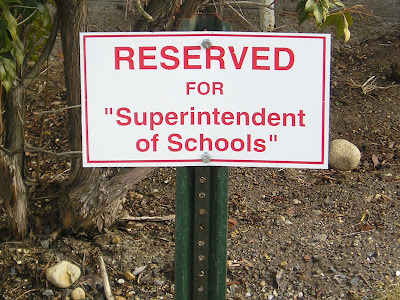 I like the idea that the person who parks here has "Superintendent of Schools" as their mafia nickname. Oh, old superintendent of schools there? I think his real name is Evelyn. 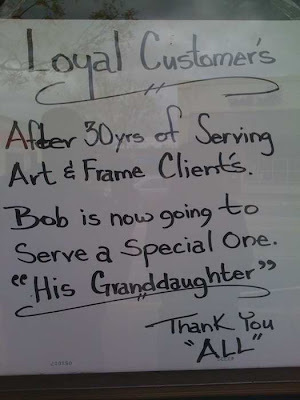 Thanks, Robb! 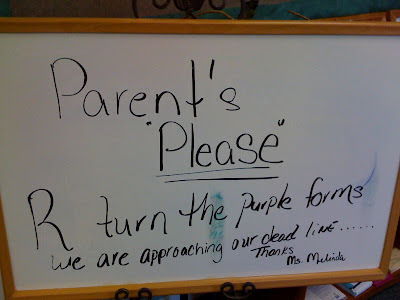 Ron saw this in front of programs at a child's school play. I hope there are families running around with one program plus a mangled torn portion of one. 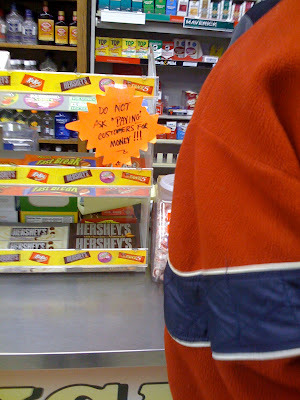 Kaylyn saw this in a gas station mini-mart. I guess on these microwaves, the heating is minimal. 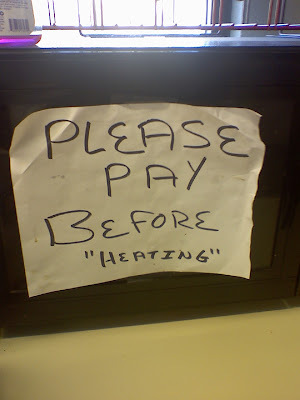 it says: do not ask "paying" customers for money. 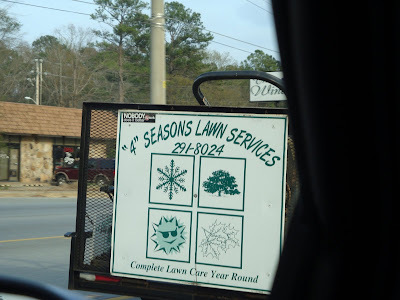 So I guess if you don't ask them for money, they can't really pay. 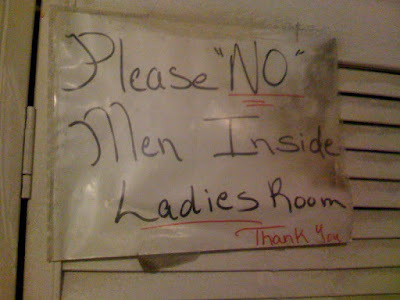 So that would make them "paying" customers, right? Thanks, Kevin. Though I'm not a person who has purchased a lot of expensive items (grad student stipends only go so far) it is my understanding that those who sell them are the over-friendly type. Thanks, Chris. 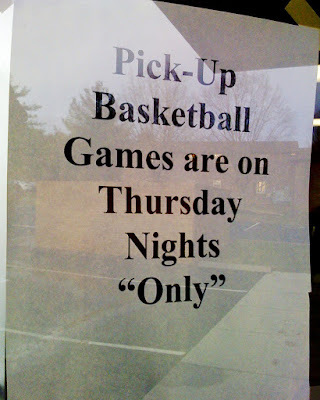 Paul writes, "apparently they have secret pick up games on nights other than thursday." 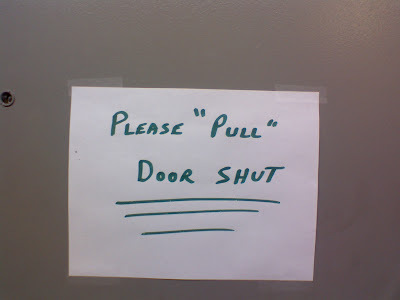 I'm not sure what you are really supposed to do to shut the door, but it's definitely not pulling. Thanks, Rachel. Jeff sent me this one. 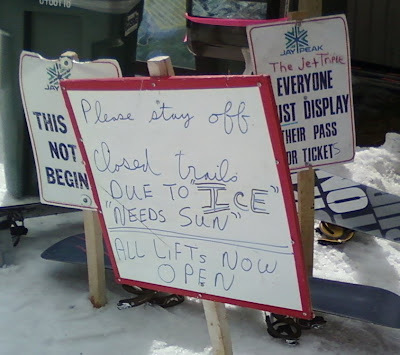 I wonder why the trails are really closed? Bears? Crime scene? Julie sent me this. 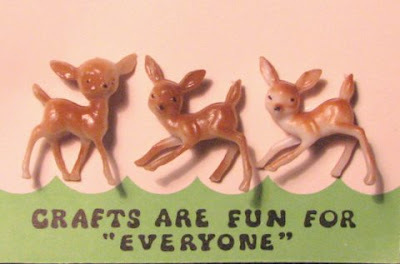 I guess crafts are only fun for the people who don't have to clean up. 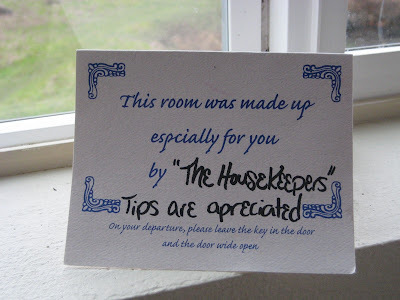 I like to think that "The Housekeepers" are a gang, like "The Jets" and this is their version of tagging. 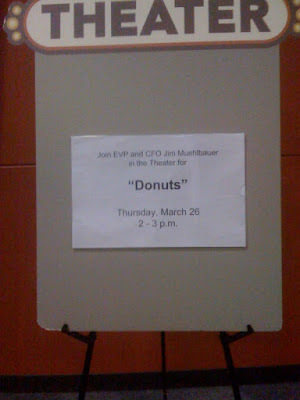 Later they'll have a rumble with their rivals, "The Caterers." 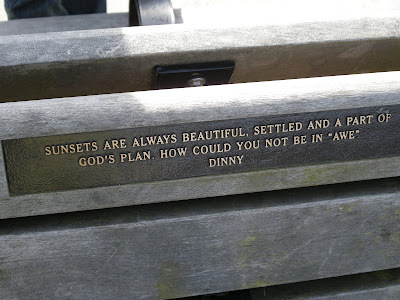 Thanks, Denise. 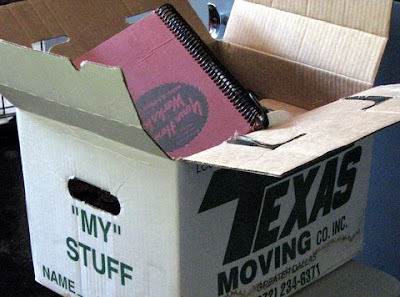 When Julie's husband was laid off, they gave him this box to bring his stuff home in. I guess they are expecting a few office supplies to suddenly become "yours". 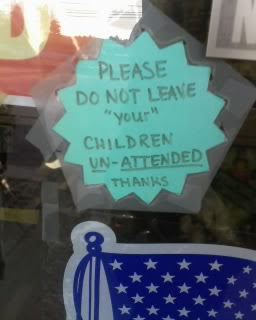 Michael notes that this was spotted at "the famous, customer unfriendly Lorenzo's Pizza on South Street in Philadelphia." 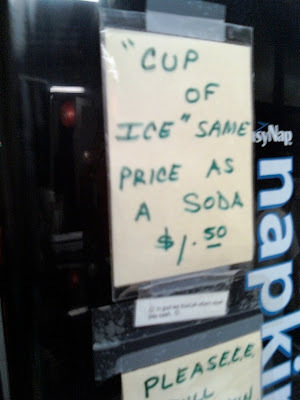 I don't know what people really take when they ask for a "cup of ice" but Lorenzo is on to them. I don't know what "shake a baby" could be code for that is more disturbing than baby shaking. Thanks, Manolo. Ben spotted this one in Minneapolis. I am imagining a den of various vices you might want to engage in while telling your spouse/parent that you'll be down at "the church." I guess it's not really "His Granddaughter"? 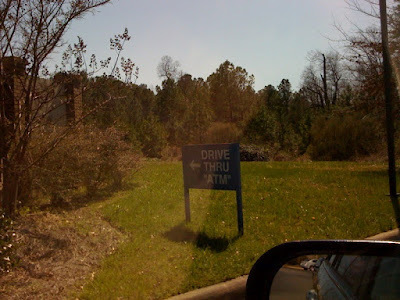 I'm very confused about what this sign actually means. thanks ("thanks?") Ken. 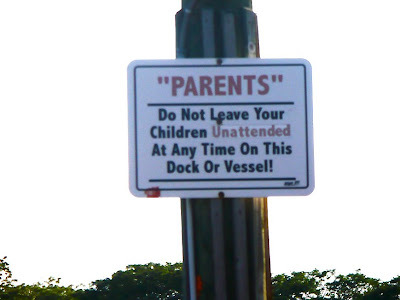 I guess if you leave your children unattended on a dock, you're not exactly a shining example of parenthood, but I'm not sure it calls for sarcasm. It's a tough job! Thanks, Chloe. 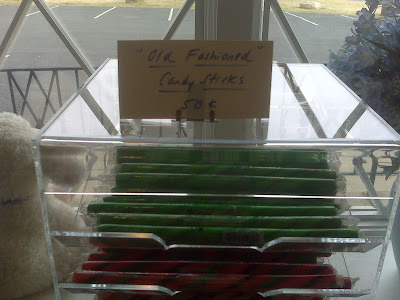 Well, some would say these are "old fashioned" but I say they are classic. Thanks, Kate. 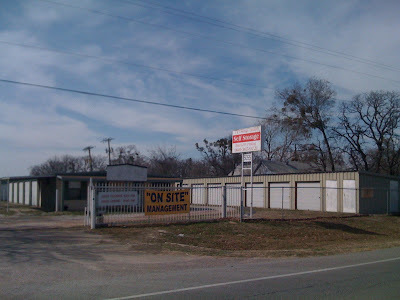 My friend Kricket sent me this one, though her sister Rene took the photo out the window of a moving car. 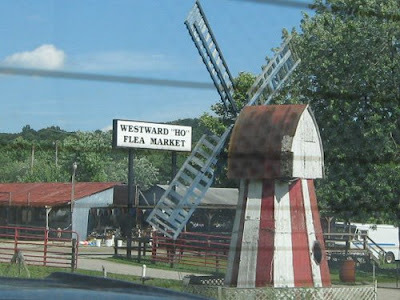 I guess a Westward "ho" is better than an Eastward one? You know, I don't care whose kids they are, keep an eye on 'em. Thanks, Danielle. 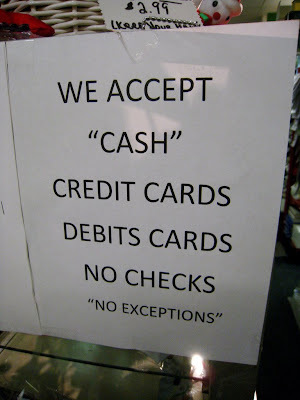 You know, "cash" is a slang term used for money as notes or coins. Thanks, Margo! 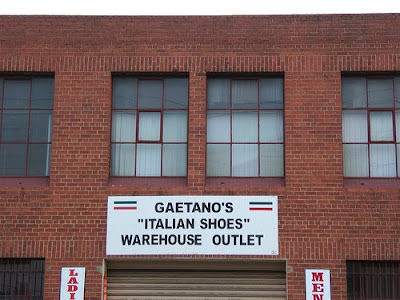 This place has Sicilian belts or something. Thanks to nix williams, longtime "blog" friend. I mean, seriously, who wants to be out there in the winter. I'll stay home with some hot chocolate, thanks. Thanks, Casey. 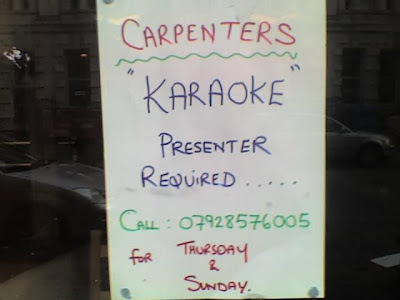 Kristy writes, "makes you wonder just what you'll be 'hosting,' doesn't it?" 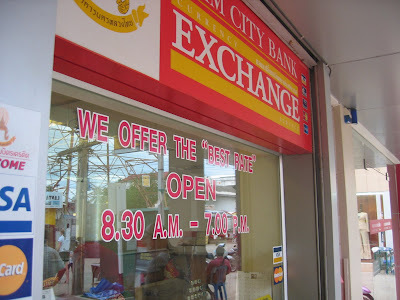 Kate saw this one in Thailand. 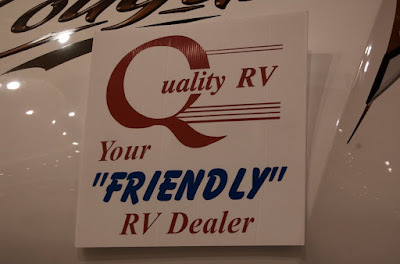 I guess the rate here is among the better ones. I think maybe my favorite part of this one is that they are approaching the dead line. Makes the expression seem so much more literal. Thanks, Karyn. 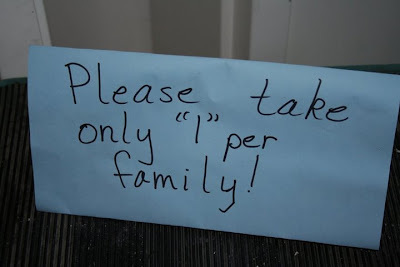 Ok, they're in somebody's home. 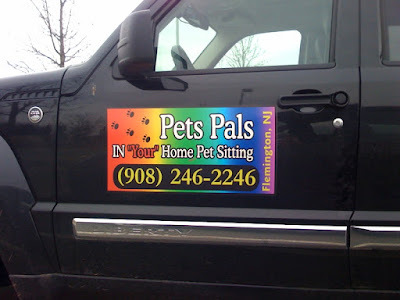 At least they aren't "pet sitting" there. Thanks, Doc. I think if you have to put "cookie" in quotation marks, it's not worth the calories. Thanks, Sharyn. Paul and Abby spotted this one (the url is theirs). 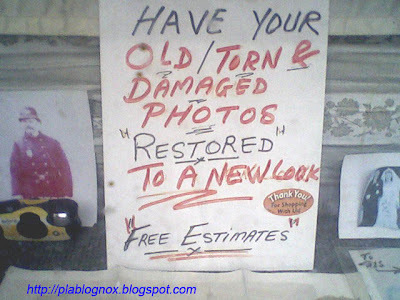 Looks like they destroy your old photos, so that's nice. Andrew sent me this one. 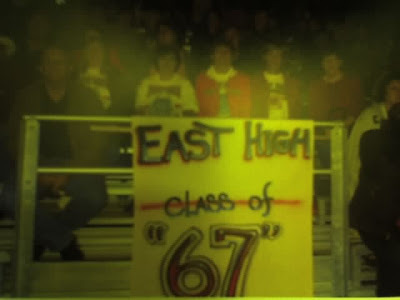 Hey, if you were in the class of... well, nevermind... you might want to lie about it too. 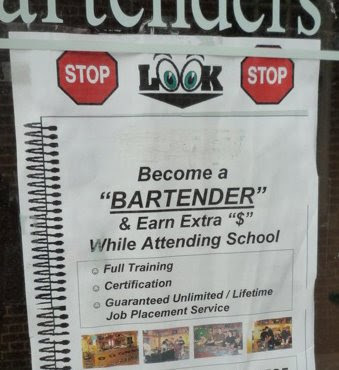 Rebecca writes, "When I was a bartender years ago, friends and family often asked when I was going to get a real job. 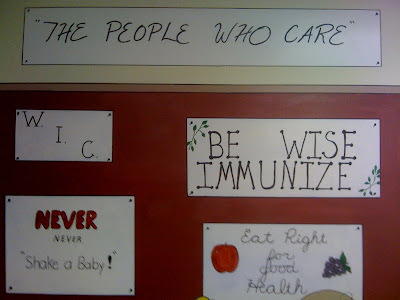 So, this sign stood out to me, as it so blatantly questions the veracity of the profession." 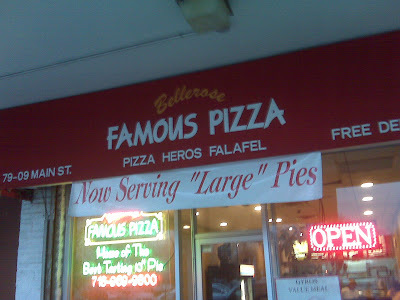 I guess their pizzas are relatively large, but not, like, man-sized pizzas. Thanks, Sara. 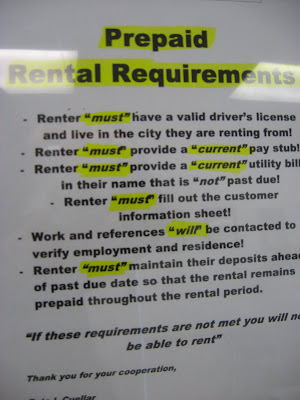 There seems to be some wiggle room in these enterprise policies. Thanks, mk. 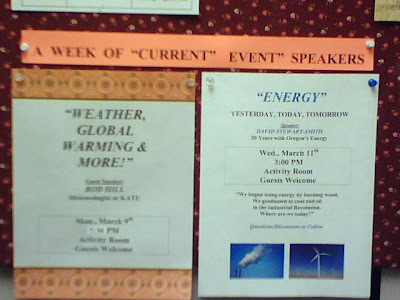 Ok, titles in quotation marks are grammatical though unnecessary on a flier like that, but the dangling quotes at the end of events are just priceless. Thanks, Katie. 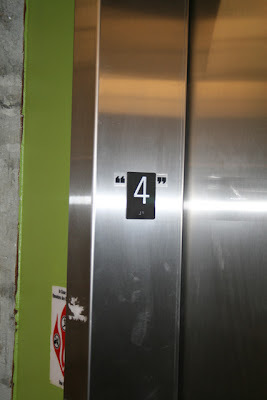 Noah spotted this one at Syracuse, where their floor numbers are approximations. Or jokes. Or something. Laura spotted this one at a Japanese restaurant in Cambridge, MA. 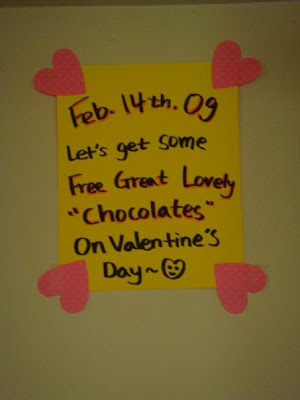 I have no idea what "chocolates" means but I think it's sinister, gross, or both.